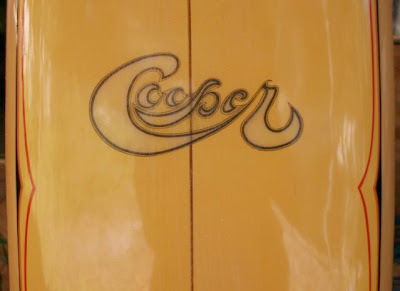 Gavin from Pacific Palms has sent me pics of his beautiful Cooper bonzer that I'm posting for the pleasure of Tim in Hawaii. Gav was apologetic that the board has been restored with a painted finish. My opinion on restoration is simple. Over paint to hide the life and history of the board - no. 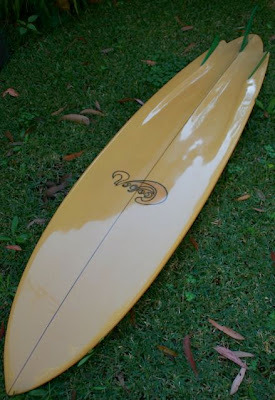 beautiful looking board tho, paint finish or not. Sheeeow! ...Still a beauty of a shape, regardless. I'd like to see the "before" pics. Whoever did the resto work, did a nice job though. 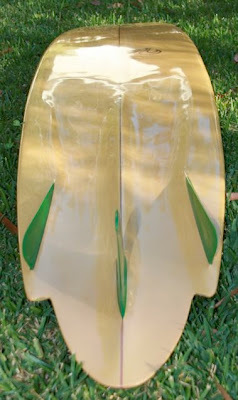 Mahalo Gavin & Damion for posting the Bob Cooper Bonzer pics. Much respect to the Campbell Brothers for the Bonzer Surfboard. Hi , I have a Maurice Cole surfboard it is signed has a koala with spears logo and numbers on it , it needs 3 new fins , legrope and .. Wax? . I like the board but want to know wat sort if price I'm looking at to fix it ? If anybody can give me any info about fixing or the board itself please msg me ..